The Sweet Amanda’s kiosk is something to behold. Its dazzling, attention-grabbing graphics alone turn it into a people magnet, attracting kids of all ages, candy lovers, and wonder-struck onlookers wherever it is found. But under its brightly colored skin the kiosk is a fully automated, completely sanitary mechanical marvel, capable of dispensing hundreds of high-margin bulk candies, both wrapped and unwrapped, alongside a wide range of novelty items and toys. Each visit to Sweet Amanda’s is an experience that begins with a look through the windows at the colorful assortment of candies. On each side of the Kiosk consumers are captivated by the color-coordinated capsules containing novelty items as well as pre-packaged munchies. From there it is a step up to the central display panel, where creative combinations of candies can be Mixed-N-Matched and capsule items selected via touch screen ordering. 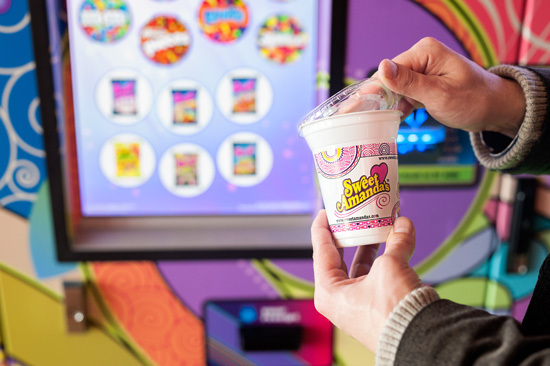 The candies can then be viewed being individually deposited onto a conveyor belt, which, in turn, pours your custom candy collection into your “go cup” waiting below. Toys, novelties, and packaged goods roll from their vertical tubes, located at the sides of the machines, into pick-up compartments in the front of the kiosk. 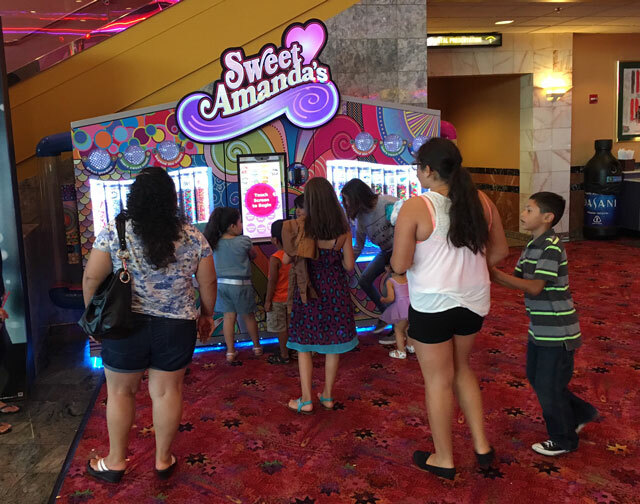 Sweet Amanda’s fully automated candy kiosk is the most captivating cup of candy you’ll ever have…You have to see it to believe it! For a spec sheet on our kiosks, click here. 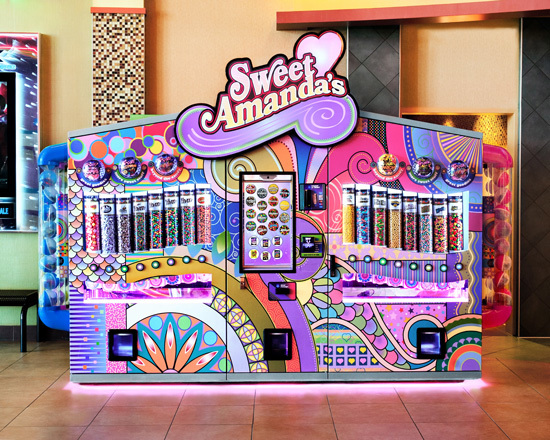 The advanced technologies built into Sweet Amanda’s kiosks are at the forefront of automated machine technology. Sweet Amanda’s engineering and design will enable its kiosks to be a cutting-edge global product well into the future. Sweet Amanda’s has totally revolutionized the candy vending industry which will never be the same again.